"Addison's anaemia" redirects here. For the disease affecting the adrenal glands, see Addison's disease. Vitamin B12 deficiency anemia, of which pernicious anemia is a type, is a disease in which not enough red blood cells are present due to a lack of vitamin B12. The most common initial symptom is feeling tired. Other symptoms may include shortness of breath, pale skin, chest pain, numbness in the hands and feet, poor balance, a smooth, red tongue, poor reflexes, and confusion. If treatment is not provided, some of these problems may become permanent. Although pernicious anemia technically refers to cases resulting from not enough intrinsic factor, it is often used to describe all cases of anemia due to not enough vitamin B12. Lack of intrinsic factor is most commonly due to an autoimmune attack on the cells that make it in the stomach. It can also occur following the surgical removal of part of the stomach or from an inherited disorder. Other causes of low vitamin B12 include a poor diet, celiac disease, and a tapeworm infection. When suspected, diagnosis is made by blood and, occasionally, bone marrow tests. Blood tests may show fewer but larger red blood cells, low numbers of young red blood cells, low levels of vitamin B12, and antibodies to intrinsic factor. Pernicious anemia due to lack of intrinsic factor is not preventable. Vitamin B12 deficiency due to other causes may be prevented with a balanced diet or with supplements. Pernicious anemia can be easily treated with either injections or pills of vitamin B12. If the symptoms are severe, injections are typically recommended initially. For those who have trouble swallowing pills, a nasal spray is available. Often, treatment is lifelong. Pernicious anemia due to autoimmune problems occurs in about one per 1000 people. Among those over the age of 60, about 2% have the condition. It more commonly affects people of northern European descent. Women are more commonly affected than men. With proper treatment, most people live normal lives. Due to a higher risk of stomach cancer, those with pernicious anemia should be checked regularly for this. The first clear description was by Thomas Addison in 1849. The term "pernicious" means "deadly", and was used as before the availability of treatment the disease was often fatal. The symptoms of pernicious anemia come on slowly. Untreated, it can lead to neurological complications, and in serious cases, death. Many of the signs and symptoms are due to anemia itself, when anemia is present. Symptoms may consist of the triad of tingling or other skin sensations (paresthesia), tongue soreness (glossitis), and fatigue and general weakness. It presents with a number of further common symptoms, including depressive mood, low-grade fevers, diarrhea, dyspepsia, weight loss, neuropathic pain, jaundice, sores at the corner of the mouth (angular cheilitis), a look of exhaustion with pale and dehydrated or cracked lips and dark circles around the eyes, as well as brittle nails, and thinning and early greying of the hair. Because PA may affect the nervous system, symptoms may also include difficulty in proprioception, memory changes, mild cognitive impairment (including difficulty concentrating and sluggish responses, colloquially referred to as brain fog), and even psychoses, impaired urination, loss of sensation in the feet, unsteady gait, difficulty in walking, muscle weakness and clumsiness. Anemia may also lead to tachycardia (rapid heartbeat), cardiac murmurs, a yellow waxy pallor, altered blood pressure (low or high), and a shortness of breath (known as "the sighs"). The deficiency also may present with thyroid disorders. In severe cases, the anemia may cause evidence of congestive heart failure. A complication of severe chronic PA is subacute combined degeneration of spinal cord, which leads to distal sensory loss (posterior column), absent ankle reflex, increased knee reflex response, and extensor plantar response. Other than anemia, hematological symptoms may include cytopenias, intramedullary hemolysis, and pseudothrombotic microangiopathy. Pernicious anemia can contribute to a delay in physical growth in children, and may also be a cause for delay in puberty for adolescents. Vitamin B12 cannot be produced by the human body, and must be obtained from the diet. When foods containing B12 are eaten, the vitamin is usually bound to protein and is released by stomach acid. Following its release, most B12 is absorbed by the body in the small bowel (ileum) after binding to a protein known as intrinsic factor. Intrinsic factor is produced by parietal cells of the gastric mucosa (stomach lining) and the intrinsic factor-B12 complex is absorbed by cubilin receptors on the ileum epithelial cells. PA is characterised by B12 deficiency caused by the absence of intrinsic factor. PA may be considered as an end stage of immune gastritis, a disease characterised by stomach atrophy and the presence of antibodies to parietal cells and intrinsic factor. A specific form of chronic gastritis, type A gastritis or atrophic body gastritis, is highly associated with PA. This autoimmune disorder is localised to the body of the stomach, where parietal cells are located. Antibodies to intrinsic factor and parietal cells cause the destruction of the oxyntic gastric mucosa, in which the parietal cells are located, leading to the subsequent loss of intrinsic factor synthesis. Without intrinsic factor, the ileum can no longer absorb the B12. Although the exact role of Helicobacter pylori infection in PA remains controversial, evidence indicates H. pylori is involved in the pathogenesis of the disease. A long-standing H. pylori infection may cause gastric autoimmunity by a mechanism known as molecular mimicry. Antibodies produced by the immune system can be cross-reactive and may bind to both H. pylori antigens and those found in the gastric mucosa. The antibodies are produced by activated B cells that recognise both pathogen and self-derived peptides. The autoantigens believed to cause the autoreactivity are the alpha and beta subunits of the H+/K+-ATPase. Less commonly, H. pylori and Zollinger-Ellison syndrome may also cause a form of nonautoimmune gastritis that can lead to pernicious anemia. Impaired B12 absorption can also occur following gastric removal (gastrectomy) or gastric bypass surgery. In these surgeries, either the parts of the stomach that produce gastric secretions are removed or they are bypassed. This means intrinsic factor, as well as other factors required for B12 absorption, are not available. However, B12 deficiency after gastric surgery does not usually become a clinical issue. This is probably because the body stores many years' worth of B12 in the liver and gastric surgery patients are adequately supplemented with the vitamin. Although no specific PA susceptibility genes have been identified, a genetic factor likely is involved in the disease. Pernicious anemia is often found in conjunction with other autoimmune disorders, suggesting common autoimmune susceptibility genes may be a causative factor. In spite of that, previous family studies and case reports focusing on PA have suggested that there is a tendency of genetic heritance of PA in particular, and close relatives of the PA patients seem to have higher incidence of PA and associated PA conditions. Moreover, it was further indicated that the formation of antibodies to gastric cells was autosomal dominant gene determined, and the presence of antibodies to the gastric cells might not be necessarily related to the occurrence of atrophic gastritis related to PA. Although the healthy body stores three to five years' worth of B12 in the liver, the usually undetected autoimmune activity in one's gut over a prolonged period of time leads to B12 depletion and the resulting anemia. B12 is required by enzymes for two reactions: the conversion of methylmalonyl CoA to succinyl CoA, and the conversion of homocysteine to methionine. In the latter reaction, the methyl group of 5-methyltetrahydrofolate is transferred to homocysteine to produce tetrahydrofolate and methionine. This reaction is catalyzed by the enzyme methionine synthase with B12 as an essential cofactor. During B12 deficiency, this reaction cannot proceed, which leads to the accumulation of 5-methyltetrahydrofolate. This accumulation depletes the other types of folate required for purine and thymidylate synthesis, which are required for the synthesis of DNA. Inhibition of DNA replication in red blood cells results in the formation of large, fragile megaloblastic erythrocytes. The neurological aspects of the disease are thought to arise from the accumulation of methylmalonyl CoA due to the requirement of B12 as a cofactor to the enzyme methylmalonyl CoA mutase. PA may be suspected when a patient's blood smear shows large, fragile, immature erythrocytes, known as megaloblasts. A diagnosis of PA first requires demonstration of megaloblastic anemia by conducting a full blood count and blood smear, which evaluates the mean corpuscular volume (MCV), as well the mean corpuscular hemoglobin concentration (MCHC). PA is identified with a high MCV (macrocytic anemia) and a normal MCHC (normochromic anemia). Ovalocytes are also typically seen on the blood smear, and a pathognomonic feature of megaloblastic anemias (which include PA and others) is hypersegmented neutrophils. Serum vitamin B12 levels are used to detect its deficiency, but they do not distinguish its causes. Vitamin B12 levels can be falsely high or low and data for sensitivity and specificity vary widely. Normal serum levels may be found in cases of deficiency where myeloproliferative disorders, liver disease, transcobalamin II deficiency, or intestinal bacterial overgrowth are present. Low levels of serum vitamin B12 may be caused by other factors than B12 deficiency, such as folate deficiency, pregnancy, oral contraceptive use, haptocorrin deficiency, and myeloma. The presence of antibodies to gastric parietal cells and intrinsic factor is common in PA. Parietal cell antibodies are found in other autoimmune disorders and also in up to 10% of healthy individuals, making the test nonspecific. However, around 85% of PA patients have parietal cell antibodies, which means they are a sensitive marker for the disease. Intrinsic factor antibodies are much less sensitive than parietal cell antibodies, but they are much more specific. They are found in about half of PA patients and are very rarely found in other disorders. These antibody tests can distinguish between PA and food-B12 malabsorption. 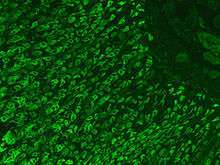 The combination of both tests of intrinsic factor antibodies and parietal cell antibodies may improve overall sensitivity and specificity of the diagnostic results. A buildup of certain metabolites occurs in B12 deficiency due to its role in cellular physiology. Methylmalonic acid (MMA) can be measured in both the blood and urine, whereas homocysteine is only measured in the blood. An increase in both MMA and homocysteine can distinguish between B12 deficiency and folate deficiency because only homocysteine increases in the latter. Elevated gastrin levels can be found in around 80-90% of PA cases, but they may also be found in other forms of gastritis. Decreased pepsinogen I levels or a decreased pepsinogen I to pepsinogen II ratio may also be found, although these findings are less specific to PA and can be found in food-B12 malabsorption and other forms of gastritis. The diagnosis of atrophic gastritis type A should be confirmed by gastroscopy and stepwise biopsy. About 90% of individuals with PA have antibodies for parietal cells; however, only 50% of all individuals in the general population with these antibodies have pernicious anemia. Forms of vitamin B12 deficiency other than PA must be considered in the differential diagnosis of megaloblastic anemia. For example, a B12-deficient state which causes megaloblastic anemia and which may be mistaken for classical PA may be caused by infection with the tapeworm Diphyllobothrium latum, possibly due to the parasite's competition with host for vitamin B12. The classic test for PA, the Schilling test, is no longer widely used, as the foregoing more efficient methods to are available. This historic test consisted, in its first step, of taking an oral dose of radiolabelled vitamin B12, followed by quantitation of the vitamin in the patient's urine over a 24-hour period via measurement of the radioactivity. A second step of the test repeats the regimen and procedure of the first step, with the addition of oral intrinsic factor. A patient with PA presents lower than normal amounts of intrinsic factor; hence, addition of intrinsic factor in the second step results in an increase in vitamin B12 absorption (over the baseline established in the first). The Schilling test distinguished PA from other forms of B12 deficiency, specifically, from Imerslund-Grasbeck Syndrome (IGS), a vitamin B12-deficiency caused by mutations in the cobalamin receptor. 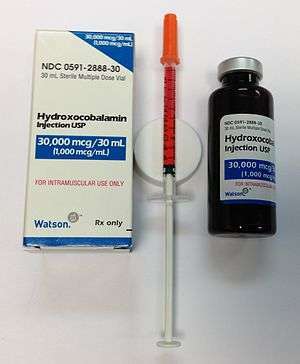 Hydroxocobalamin injection usp(1000 mcg/ml) is a clear red liquid solution of hydoxocobalamin which is available in a 30-ml brown glass multidose vial packaged in a paper box. Shown is 500 mcg B-12 (as 1/2 cc) drawn up in a 0.5-cc U-100 27 gauge x 1/2" insulin syringe, as prepared for subcutaneous injection. The treatment of PA varies by country and area. Opinions vary over the efficacy of administration (parenteral/oral), the amount and time interval of the doses, or the forms of vitamin B12 (e.g. cyanocobalamin/hydroxocobalamin). More comprehensive studies are still needed in order to validate the feasibility of a particular therapeutic method for PA in clinical practices. A permanent cure for PA is lacking, although repletion of B12 should be expected to result in cessation of anemia-related symptoms, a halt in neurological deterioration, and in cases where neurological problems are not advanced, neurological recovery and a complete and permanent remission of all symptoms, so long as B12 is supplemented. Repletion of B12 can be accomplished in a variety of ways. The standard treatment for PA has been intramuscular injections of cobalamin in the form of cyanocobalamin (CN-Cbl) and hydroxocobalamin (OH-Cbl). Treatment with high-dose vitamin B12 by mouth also appears effective. A person with well-treated PA can live a healthy life. Failure to diagnose and treat in time, however, may result in permanent neurological damage, excessive fatigue, depression, memory loss, and other complications. In severe cases, the neurological complications of pernicious anemia can lead to death - hence the name, "pernicious", meaning deadly. An association has been observed between pernicious anemia and certain types of gastric cancer, but a causal link has not been established. PA is estimated to affect 0.1% of the general population and 1.9% of those over 60, accounting for 20–50% of B12 deficiency in adults. A review of literature shows that the prevalence of PA is higher in Northern Europe, especially in Scandinavian countries, and among people of African descent, and that increased awareness of the disease and better diagnostic tools might play a role in apparently higher rates of incidence. The symptoms are first described in 1822 by Dr James Scarth Combe in the Transactions of the Medico-Chirurgical Society of Edinburgh, under the title of History of a Case of Anaemia. However, this was not investigated in more depth until 1849, by British physician Thomas Addison, from which it acquired the common name of Addison's anemia. In 1871, German physician Michael Anton Biermer (1827–1892) noticed the particular characteristic of the anemia in one of his patients; he later coined the term "progressive pernicious anemia". In 1907, Richard Clarke Cabot reported on a series of 1200 patients with PA; their average survival was between one and three years. William Bosworth Castle performed an experiment whereby he ingested raw hamburger meat and regurgitated it after an hour, and subsequently fed it to a group of 10 patients. Untreated raw hamburger meat was fed to the control group. The former group showed a disease response, whereas the latter group did not. This was not a sustainable practice, but it demonstrated the existence of an 'intrinsic factor' from gastric juice. Pernicious anemia was a fatal disease before about the year 1920, when George Whipple suggested raw liver as a treatment. The first workable treatment for pernicious anemia began when Whipple made a discovery in the course of experiments in which he bled dogs to make them anemic, then fed them various foods to see which would make them recover most rapidly (he was looking for treatments for anemia from bleeding, not pernicious anemia). Whipple discovered ingesting large amounts of liver seemed to cure anemia from blood loss, and tried liver ingestion as a treatment for pernicious anemia, reporting improvement there, also, in a paper in 1920. George Minot and William Murphy then set about to partly isolate the curative property in liver, and in 1926 showed it was contained in raw liver juice (in the process also showing it was the iron in liver tissue, not the soluble factor in liver juice, which cured the anemia from bleeding in dogs); thus, the discovery of the liver juice factor as a treatment for pernicious anemia had been by coincidence. Frieda Robscheit-Robbins worked closely with Whipple, co-authoring 21 papers from 1925-30. For the discovery of the cure of a previously fatal disease of unknown etiology, Whipple, Minot, and Murphy shared the 1934 Nobel Prize in Medicine. After Minot and Murphy's verification of Whipple's results in 1926, pernicious anemia victims ate or drank at least one-half pound of raw liver, or drank raw liver juice, every day. This continued for several years, until a concentrate of liver juice became available. In 1928, chemist Edwin Cohn prepared a liver extract that was 50 to 100 times more potent than the natural food (liver). The extract could even be injected into muscle, which meant patients no longer needed to eat large amounts of liver or juice. This also reduced the cost of treatment considerably. The active ingredient in liver remained unknown until 1948, when it was isolated by two chemists, Karl A. Folkers of the United States and Alexander R. Todd of Great Britain. The substance was a cobalamin, which the discoverers named vitamin B12. The new vitamin in liver juice was eventually completely purified and characterized in the 1950s, and other methods of producing it from bacteria were developed. It could be injected into muscle with even less irritation, making it possible to treat PA with even more ease. Pernicious anemia was eventually treated with either injections or large oral doses of B12, typically between 1 and 4 mg daily. One writer has hypothesized that Mary Todd Lincoln, the wife of American President Abraham Lincoln, had pernicious anemia for decades and died from it. Although oral megadoses and intramuscular injections are the most common methods of treatment currently available, several novel methods are being tested, with high promise for future incorporation into mainstream treatment methods. As injections are unfavourable vehicles for drug delivery, current research involves improving the passive diffusion across the ileum upon oral ingestion of cobalamin derivatives. Researchers have recently taken advantage of the novel compound sodium N-[8-(2-hydroxybenzoyl)amino]caprylate (SNAC), which greatly enhances both bioavailability and metabolic stability. SNAC is able to form a noncovalent complex with cobalamin while preserving its chemical integrity. This complex is much more lipophilic than the water-soluble vitamin B12, so is able to pass through cellular membranes with greater ease. Another method for increasing absorption through the ileum is to ingest a Cbl complex to which IF is already bound. The lack of intrinsic factor produced by the patient's body can be supplemented by using synthetic human IF produced from pea plant recombinants. However, in cases where IF-antibodies are the reason for malabsorption across the ileum, this treatment would be ineffective. Sublingual treatments have also been postulated to be more effective than oral treatments alone. A 2003 study found, while this method is effective, a dose of 500 μg of cyanocobalamin given either orally or sublingually, is equally efficacious in restoring normal physiological concentrations of cobalamin. Intranasal methods have also been studied as a vehicle for the delivery of cobalamin. A 1997 study monitored the plasma cobalamin concentration of six patients with pernicious anemia over a period of 35 days while being treated with 1500 μg of intranasal hydroxocobalamin. One hour after administration, all patients showed on average an immediate eight-fold increase in plasma cobalamin concentration and a two-fold increase after 35 days with three 1500 μg treatments. However, further studies are needed to investigate the long-term effectiveness of this delivery method. One exploratory, and potential alternative method for the treatment of pernicious anemia is the use of transdermal patches. In one such system, the patches are composed of cyanocobalamin, its stabilizers, and epidermal penetration enhancers. The transdermal route allows the cobalamin derivative to passively diffuse through the stratum corneum, epidermis, and dermis, and ultimately entering the bloodstream; hence, the cobalamin avoids the hepatic first pass effect, and so offers the potential for improved bioavailability and efficacy. Slow release increases cobalamin half-life, offering the potential of decreases in required dosage required relative to oral delivery methods. In one such system, a drug-loaded polycaprolactone fiber that is prepared as a electrospun nanofiber can release hundreds of micrograms of cobabalmin per day. 1 2 3 4 Andres E, Serraj K (2012). "Optimal management of pernicious anemia.". Journal of Blood Medicine. 3: 97–103. doi:10.2147/JBM.S25620. PMC 3441227 . PMID 23028239. 1 2 Professional guide to diseases. (9 ed.). Philadelphia: Wolters Kluwer Health/Lippincott Williams & Wilkins. 2009. p. 502. ISBN 9780781778992. ↑ Forbis, Pat (2005). Stedman's medical eponyms (2nd ed.). Baltimore, Md. : Lippincott Williams & Wilkins. p. 6. ISBN 9780781754439. ↑ "ICD-10 Version:2015". apps.who.int. Retrieved 2015-11-13. 1 2 3 4 5 "What Is Pernicious Anemia?". NHLBI. April 1, 2011. Retrieved 14 March 2016. ↑ "What Are the Signs and Symptoms of Pernicious Anemia?". NHLBI. April 1, 2011. Retrieved 14 March 2016. ↑ "What Causes Pernicious Anemia?". NHLBI. April 1, 2011. Retrieved 14 March 2016. ↑ "How Is Pernicious Anemia Diagnosed?". NHLBI. April 1, 2011. Retrieved 14 March 2016. ↑ "How Can Pernicious Anemia Be Prevented?". NHLBI. April 1, 2011. Retrieved 14 March 2016. ↑ "How Is Pernicious Anemia Treated?". NHLBI. April 1, 2011. Retrieved 14 March 2016. 1 2 "Living With Pernicious Anemia". NHLBI. April 1, 2011. Retrieved 14 March 2016. ↑ Greer, John P. (2009). Wintrobe's clinical hematology. (12th ed.). Philadelphia: Wolters Kluwer Health/Lippincott Williams & Wilkins. p. 1157. ISBN 9780781765077. ↑ Wailoo, Keith (1999). "The Corporate "Conquest" of Pernicious Anemia". Drawing blood technology and disease identity in twentieth-century America (Johns Hopkins Paperbacks ed.). Baltimore, Md. : Johns Hopkins University Press. p. Chapter 4. ISBN 9780801870293. ↑ Dictionary of Medicine. Routledge. 2014. p. 404. ISBN 9781135928414. ↑ Tamparo, Carol (2016). Diseases of the Human Body. F.A. Davis. p. 295. ISBN 9780803657915. ↑ In 20% of cases of cobalamin deficiency, anemia is not observed. 1 2 3 4 5 Ramani, James Carton, Richard Daly, Pramila (2007). Clinical pathology. Oxford, ENG: Oxford University Press. ISBN 0198569467. 1 2 3 Turgeon, Mary L. (2005). Clinical hematology : theory and procedures (4th ed.). Philadelphia: Lippincott Williams & Wilkins. ISBN 0781750075. 1 2 Hvas AM, Nexo E (November 2006). "Diagnosis and treatment of vitamin B12 deficiency—an update.". Haematologica. 91 (11): 1506–12. PMID 17043022. 1 2 3 Wickramasinghe, SN (November 2006). "Diagnosis of megaloblastic anaemias.". Blood reviews. 20 (6): 299–318. doi:10.1016/j.blre.2006.02.002. PMID 16716475. ↑ Christensen EI, Birn H (April 2002). "Megalin and cubilin: multifunctional endocytic receptors". Nat. Rev. Mol. Cell Biol. 3 (4): 256–66. doi:10.1038/nrm778. PMID 11994745. 1 2 3 Banka S, Ryan K, Thomson W, Newman WG (June 2011). "Pernicious anemia – genetic insights.". Autoimmunity reviews. 10 (8): 455–9. doi:10.1016/j.autrev.2011.01.009. PMID 21296191. ↑ De Block CE, De Leeuw IH, Van Gaal LF (February 2008). "Autoimmune gastritis in type 1 diabetes: a clinically oriented review.". The Journal of Clinical Endocrinology and Metabolism. 93 (2): 363–71. doi:10.1210/jc.2007-2134. PMID 18029461. 1 2 3 Lahner E, Annibale B (November 2009). "Pernicious anemia: New insights from a gastroenterological point of view". World J. Gastroenterol. 15 (41): 5121–8. doi:10.3748/wjg.15.5121. PMC 2773890 . PMID 19891010. ↑ Desai HG, Gupte PA (December 2007). "Helicobacter pylori link to pernicious anaemia.". The Journal of the Association of Physicians of India. 55: 857–9. PMID 18405134. ↑ Kaferle J, Strzoda CE (Feb 1, 2009). "Evaluation of macrocytosis.". American family physician. 79 (3): 203–8. PMID 19202968. ↑ von Drygalski A, Andris DA (Apr–May 2009). "Anemia after bariatric surgery: more than just iron deficiency.". Nutrition in clinical practice : official publication of the American Society for Parenteral and Enteral Nutrition. 24 (2): 217–26. doi:10.1177/0884533609332174. PMID 19321896. ↑ John S, Hoegerl C (November 2009). "Nutritional deficiencies after gastric bypass surgery.". The Journal of the American Osteopathic Association. 109 (11): 601–4. PMID 19948694. ↑ Oh R, Brown DL (Mar 1, 2003). "Vitamin B12 deficiency.". American family physician. 67 (5): 979–86. PMID 12643357. ↑ O'Leary F, Samman S (March 2010). "Vitamin B12 in health and disease.". Nutrients. 2 (3): 299–316. doi:10.3390/nu2030299. PMC 3257642 . PMID 22254022. ↑ Stover, PJ (June 2004). "Physiology of folate and vitamin B12 in health and disease.". Nutrition Reviews. 62 (6 Pt 2): S3–12; discussion S13. doi:10.1111/j.1753-4887.2004.tb00070.x. PMID 15298442. ↑ Pagana, Timothy James; Pagana, Kathleen Deska (2006). Mosby's manual of diagnostic and laboratory tests. Mosby Elsevier. ISBN 0-323-03903-0. ↑ Devalia V (August 2006). "Diagnosing vitamin B-12 deficiency on the basis of serum B-12 assay". BMJ. 333 (7564): 385–6. doi:10.1136/bmj.333.7564.385. PMC 1550477 . PMID 16916826. 1 2 3 Snow, CF (Jun 28, 1999). "Laboratory diagnosis of vitamin B12 and folate deficiency: a guide for the primary care physician". Archives of Internal Medicine. 159 (12): 1289–98. doi:10.1001/archinte.159.12.1289. PMID 10386505. ↑ Grasbeck R (2006). "Imerslund-Grasbeck syndrome (selective vitamin B12 malabsorption with proteinuria)". Orphanet Journal of Rare Diseases. 1 (1): 17. 1 2 Moridani, Majid; Shana Ben-Poorat (March 2006). "Laboratory Investigation of Vitamin B12 Deficiency". LabMedicine. 37 (3): 166–74. doi:10.1309/cvhkle2r4w68k2nq. ↑ Butler CC, Vidal-Alaball J, Cannings-John R, et al. (June 2006). "Oral vitamin B12 versus intramuscular vitamin B12 for vitamin B12 deficiency: a systematic review of randomized controlled trials". Family Practice. 23 (3): 279–85. doi:10.1093/fampra/cml008. PMID 16585128. ↑ Ramakrishnan, edited by Usha (2000). Nutritional anemias. Boca Raton: CRC Press. ISBN 0849385695. ↑ Andres E., Serra K. (2012). "Optimal management of pernicious anemia". Journal of Blood Medicine. 3: 97–103. 1 2 Andrès, E.; Fothergill, H.; Mecili, M. (2010). "Efficacy of oral cobalamin (vitamin B12) therapy". Expert Opinion on Pharmacotherapy. 11 (2): 249–256. doi:10.1517/14656560903456053. PMID 20088746. ↑ Andrès, E.; Dali-Youcef, N.; Vogel, T.; Serraj, K.; Zimmer, J. (2009). "Oral cobalamin (vitamin B12) treatment. An update". International Journal of Laboratory Hematology. 31: 1–8. doi:10.1111/j.1751-553X.2008.01115.x. ↑ Carmel, R. (7 July 2008). "How I treat cobalamin (vitamin B12) deficiency". Blood. 112 (6): 2214–2221. doi:10.1182/blood-2008-03-040253. PMC 2532799 . PMID 18606874. ↑ Stabler S. P., Allen R. H. (2004). "Vitamin B12 deficiency as a worldwide problem". Annual Review of Nutrition. 24 (1): 299–326. doi:10.1146/annurev.nutr.24.012003.132440. ↑ "History of Leith, Edinburgh". leithhistory.co.uk. Retrieved 11 March 2016. ↑ Enersen, Ole Daniel (2016). "Whonamedit Dictionary of Medical Eponyms". whonamedit.com. Retrieved 11 March 2016. ↑ William B. Castle 1897–1990 A Biographical Memoir by James H. Jandl Copyright 1995 National Academies Press Washington D.C.
↑ Nobel Prize archive. "The Nobel Prize in Physiology or Medicine 1934" (Nobelprize.org). Retrieved 2012-08-05. ↑ John G. Sotos, What an Afflication -- Mary Todd Lincoln's Fatal Pernicious Anemia. Perspectives in Biology and Medicine. 2015; 58: 419-443. ↑ Castelli, M. C.; Wong, D. F.; Friedman, K.; Riley, M. G. I. (2011). "Pharmacokinetics of Oral Cyanocobalamin Formulated with Sodium N-\8-(2-hydroxybenzoyl)amino]caprylate (SNAC): An Open-Label, Randomized, Single-Dose, Parallel-Group Study in Healthy Male Subjects". Clinical Therapeutics. 33 (7): 934–945. doi:10.1016/j.clinthera.2011.05.088. PMID 21722960. ↑ Fedosov, S. N.; Laursen, N. B.; Nexo, E.; Moestrup, S. K.; Petersen, T. E.; Jensen, E. O.; Berglund, L. (2003). "Human intrinsic factor expressed in the plant Arabidopsis thaliana". European Journal of Biochemistry. 270 (16): 3362–3367. doi:10.1046/j.1432-1033.2003.03716.x. PMID 12899693. ↑ Sharabi, A.; Cohen, E.; Sulkes, J.; Garty, M. (2003). "Replacement therapy for vitamin B12 deficiency: Comparison between the sublingual and oral route". British Journal of Clinical Pharmacology. 56 (6): 635–638. doi:10.1046/j.1365-2125.2003.01907.x. PMC 1884303 . PMID 14616423. ↑ Slot WB, Merkus FW, Van Deventer SJ, Tytgat GN (August 1997). "Normalization of plasma vitamin B12 concentration by intranasal hydroxocobalamin in vitamin B12-deficient patients". Gastroenterology. 113 (2): 430–3. doi:10.1053/gast.1997.v113.pm9247460. PMID 9247460. ↑ Zeltman, Jon D. (2015-01-27). "Patent US20080233180 - Transdermal Patch and Method For Delivery Of Vitamin B12". google.com. Retrieved 11 March 2016. Priority date, 2007-03-19. ↑ Madhaiyan, K.; Sridhar, R.; Sundarrajan, S.; Venugopal, J. R.; Ramakrishna, S. (2013). "Vitamin B12 Loaded Polycaprolactone Nanofibers: A Novel Transdermal Route for the Water Soluble Energy Supplement Delivery". International Journal of Pharmaceutics. 444 (1–2): 70–76. doi:10.1016/j.ijpharm.2013.01.040. PMID 23370432.